Whether you are a landowner, employer, or a school administrator, you need to learn how to write an effective and concise termination letter. 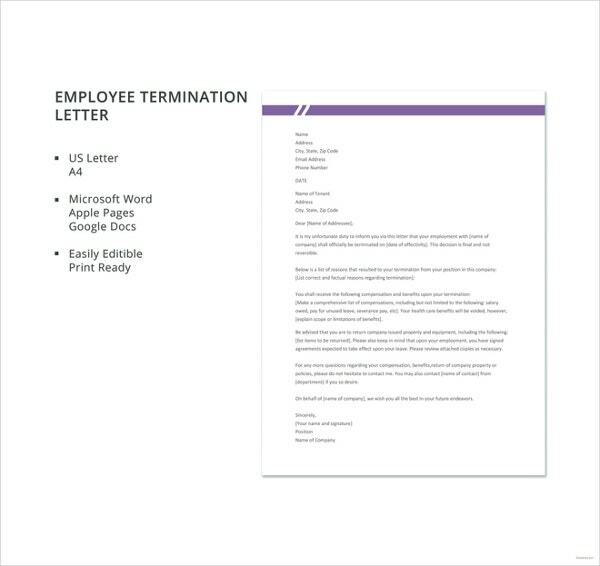 It is important that the termination letter you send is appropriate for its purpose. It must also address all the necessary points of discussion in a contractual termination. 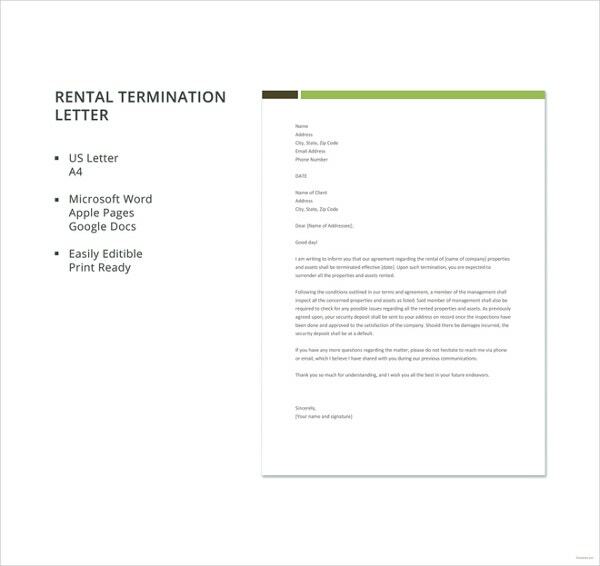 We here are providing you with easily downloadable termination letter examples. 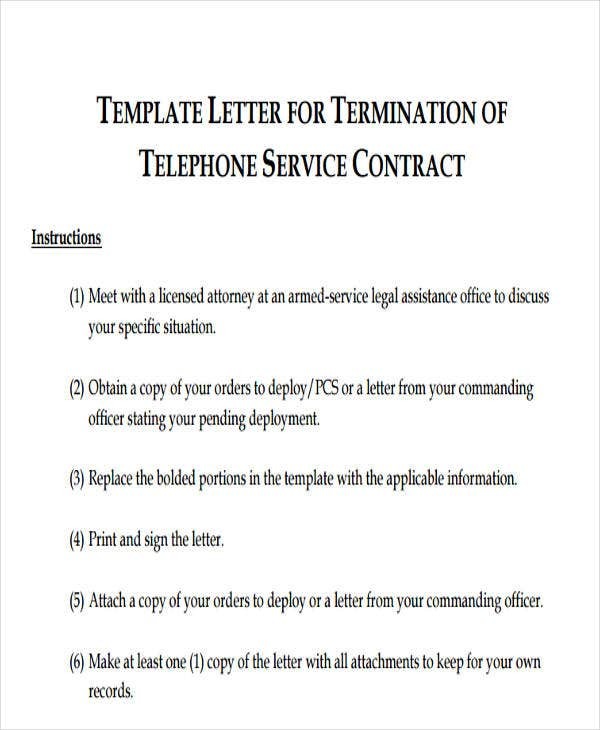 These templates can help you draft the proper form and content of termination letters. Our templates, too, are flexible and easy to edit since these are available in PDF and Microsoft Word formats. Scroll down below and select the template you need! 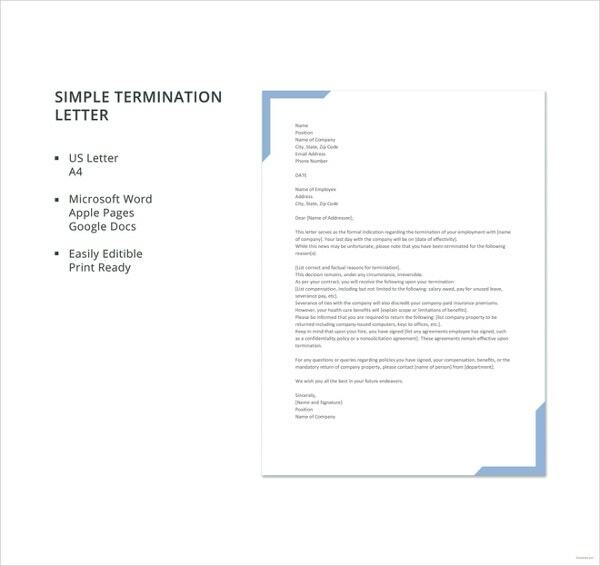 Why Do We Need Termination Letters? 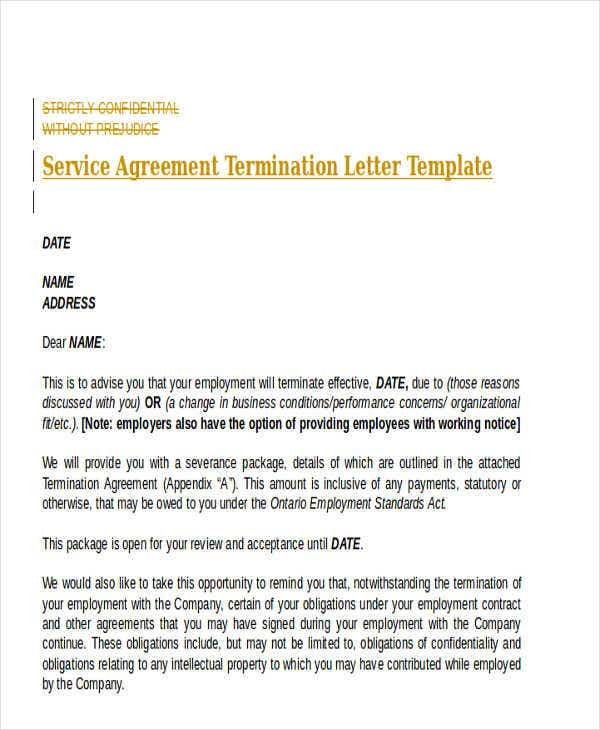 A termination letter is a document which contains an individual’s decision to terminate an existing contract, agreement, or legally formed relationship. 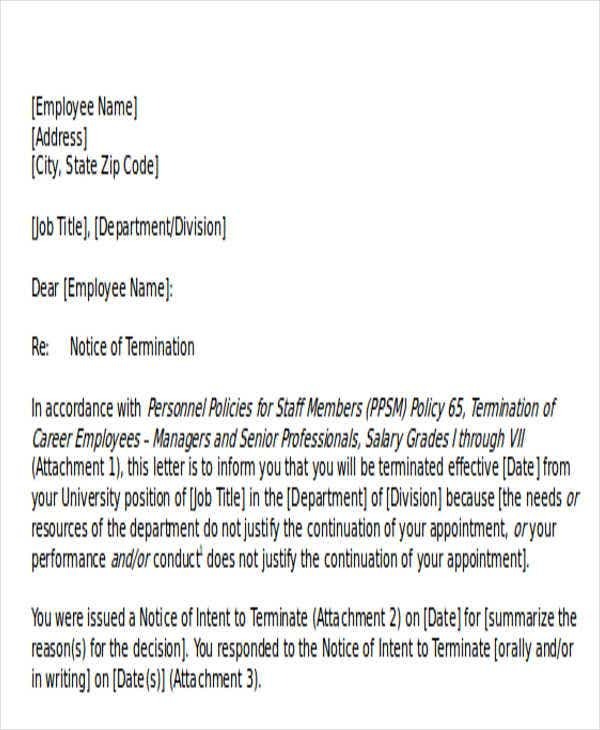 This termination letter expounds on the terms of the termination among many other factors. 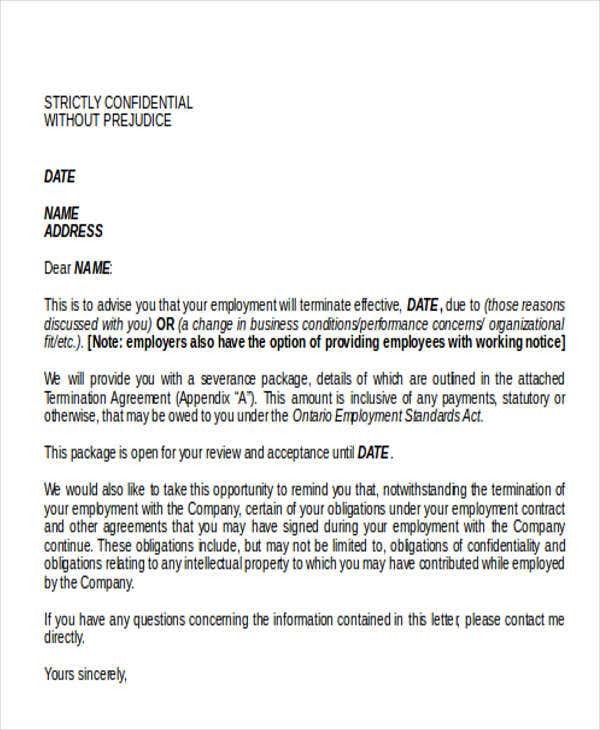 A termination letter serves as an effective termination of a contract or it may need the termination acceptance of the other party involved. 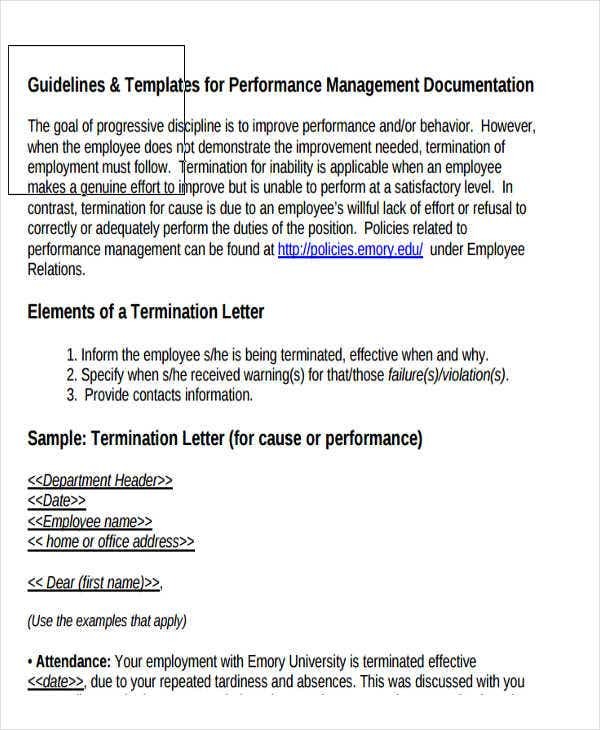 Whatever the case may be, a termination letter must be comprehensive and informative. That is why, if you are in the process of writing one, make sure that the content of your termination letter is complete. 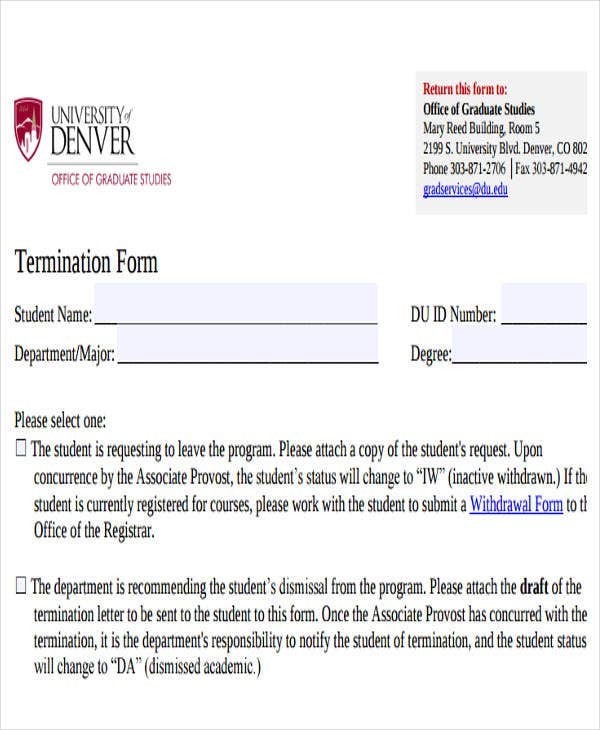 To help guide you in writing a proper termination letter, refer to our website’s collection of Termination Letter Examples, which you may use on its own. 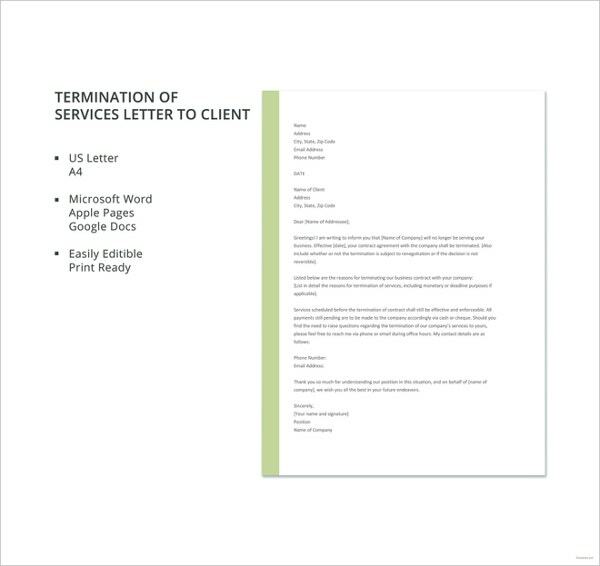 Why Is It Important to Send a Termination Letter? To avoid possible damaging repercussions when breaking off a contract or agreement, of course. 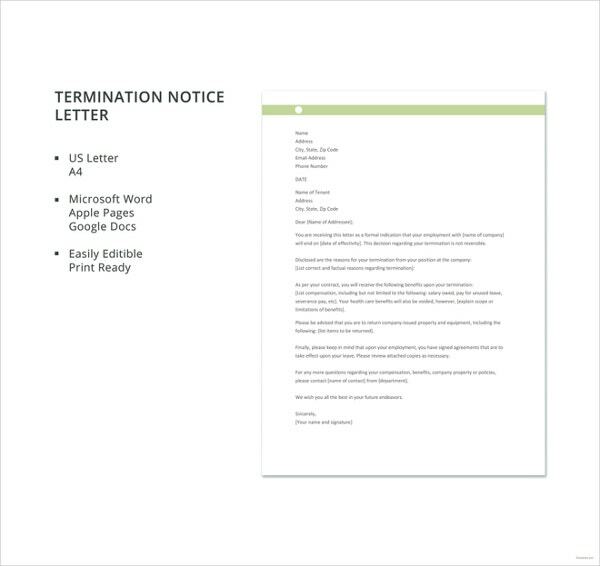 Here we discuss why it is necessary to submit termination letters. 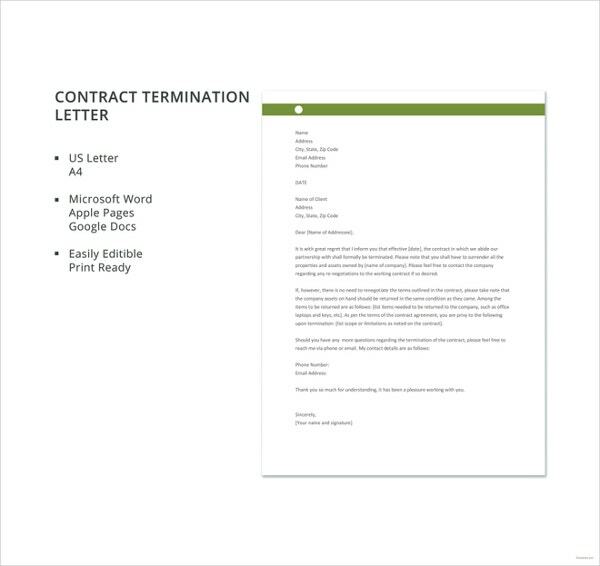 A termination letter is in written form; hence, it would be easier to document it physically or digitally. For future references, one can simply pull out the copy of a termination letter from the archives. 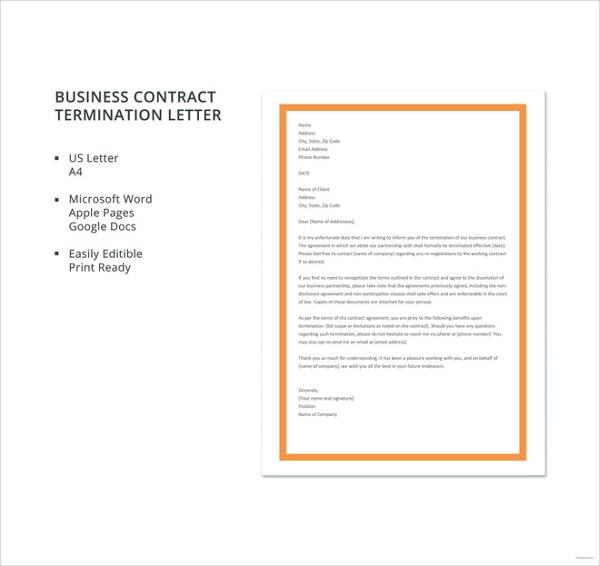 Most termination letters are issued within organizations, companies, universities, and between business partners. Since organizations have goals and visions, the members of such can better improve their operations by analyzing their past operations. 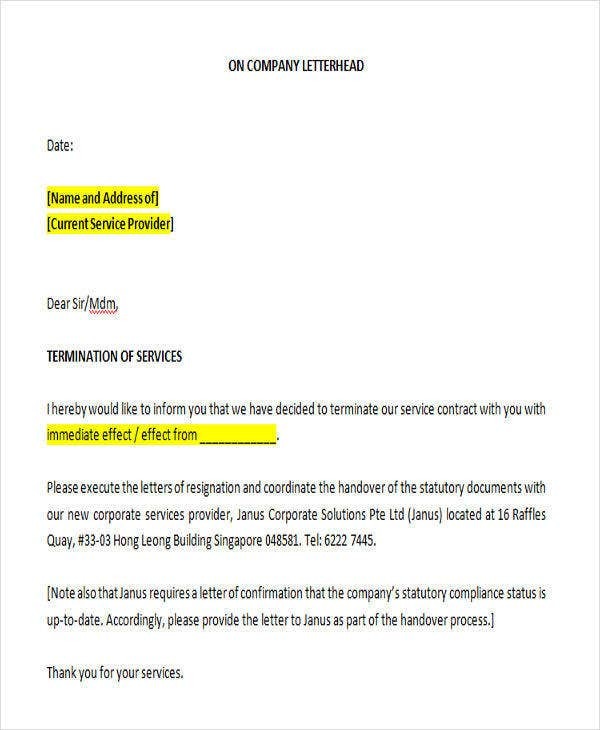 One method to do this is to refer to termination letters in order to analyze the agreements and contracts an organization has agreed to as well as the subsequent grounds for its termination. Contractual termination is a very relevant aspect of an organization’s operations which must be examined meticulously. In case of confusion as to the legality of the dissolution of a contract or partnership, the termination letter serves as sufficient evidence. 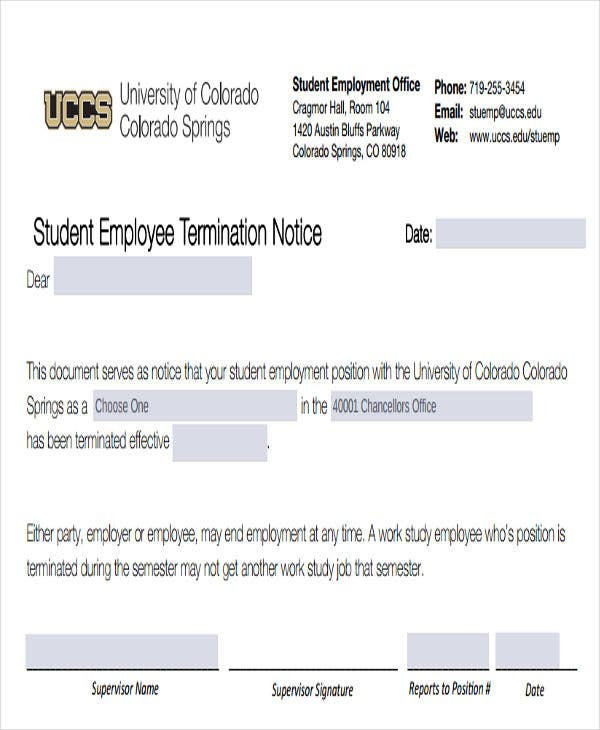 Since a termination letter is signed by both parties after agreeing to terminate a contract, this would negate all disputes and claims of one party. 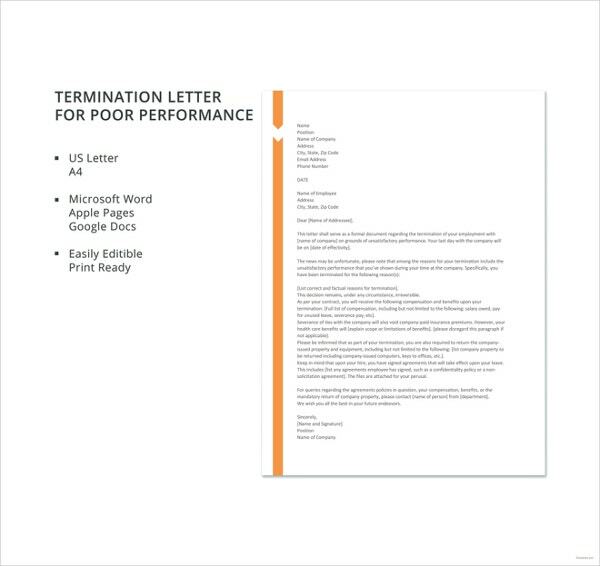 What Do You Include in a Termination Letter? 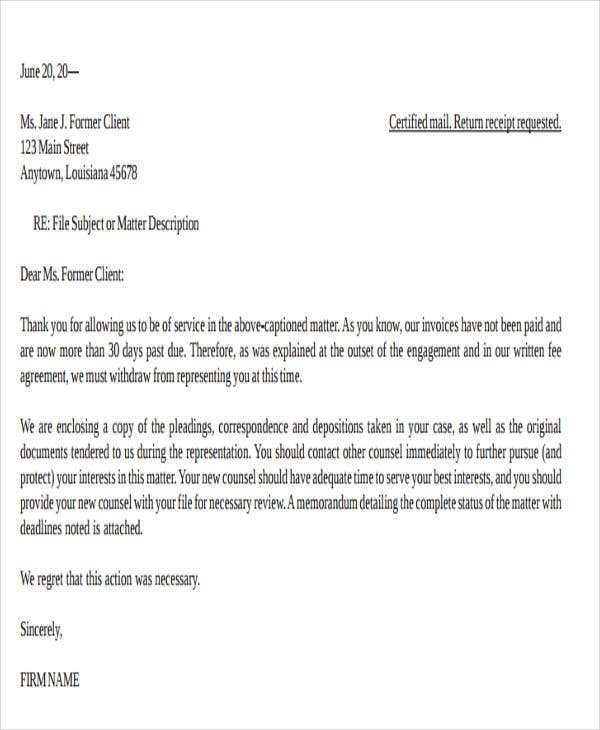 See more references from our website to have a more in-depth understanding of the formatting of Contract Termination Letters. What’s in a Lease Agreement Termination? 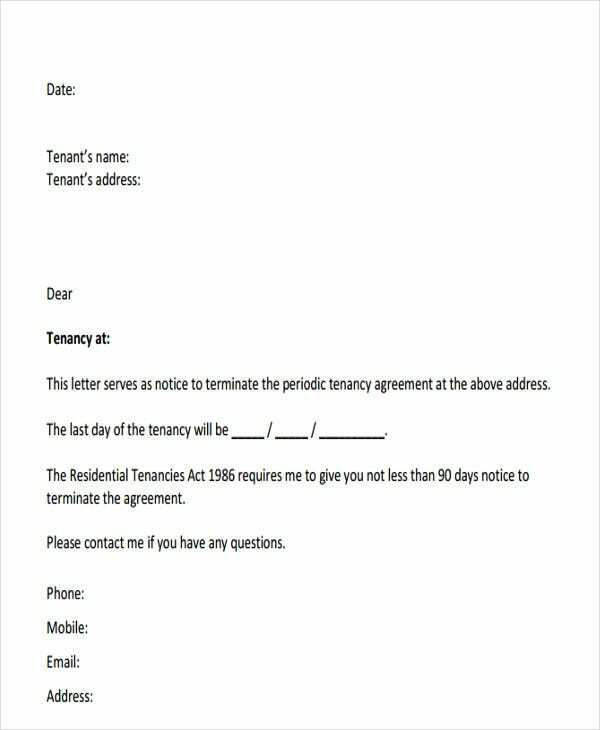 A lease agreement termination letter is written for the purpose of informing a tenant or a landlord regarding the other party’s intention to terminate a lease contract or agreement. More often than not, the termination of a lease agreement is initiated by the landlord or the property owner. 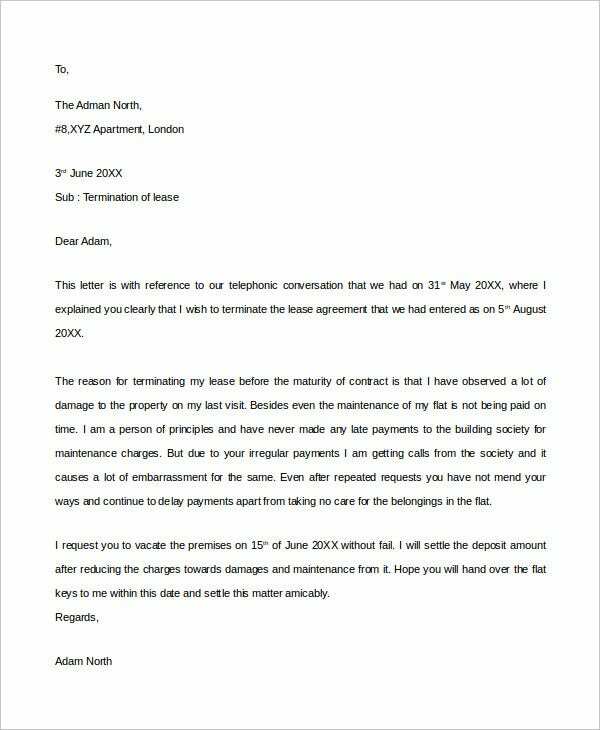 For this reason, the lease agreement termination must be done properly by sending a concise and informative lease agreement termination letter to the other party. 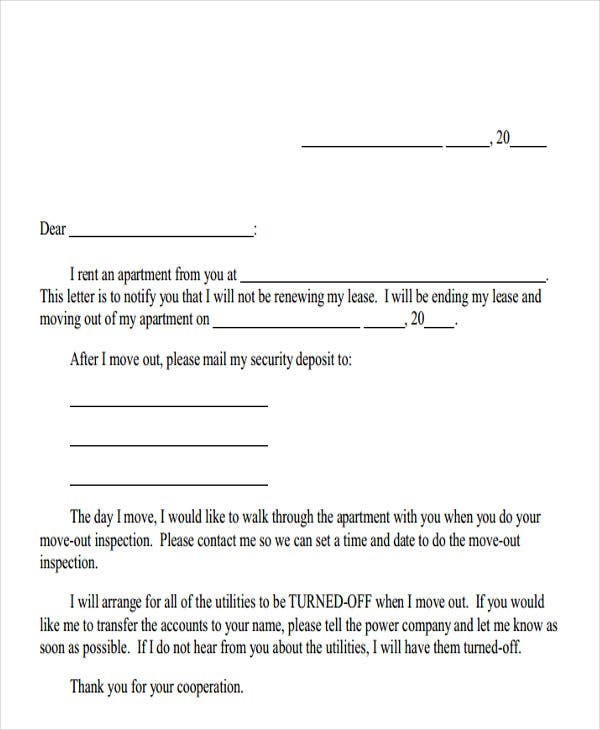 If you are currently in the process of writing one, feel free to refer to our lease agreement termination letter templates on this page. 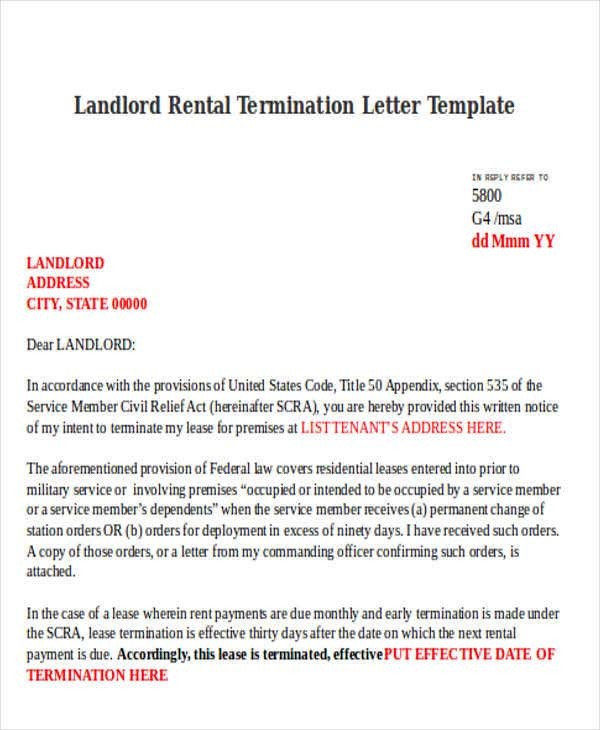 You may also opt to refer to our website’s collection of Rental Termination Letter templates. 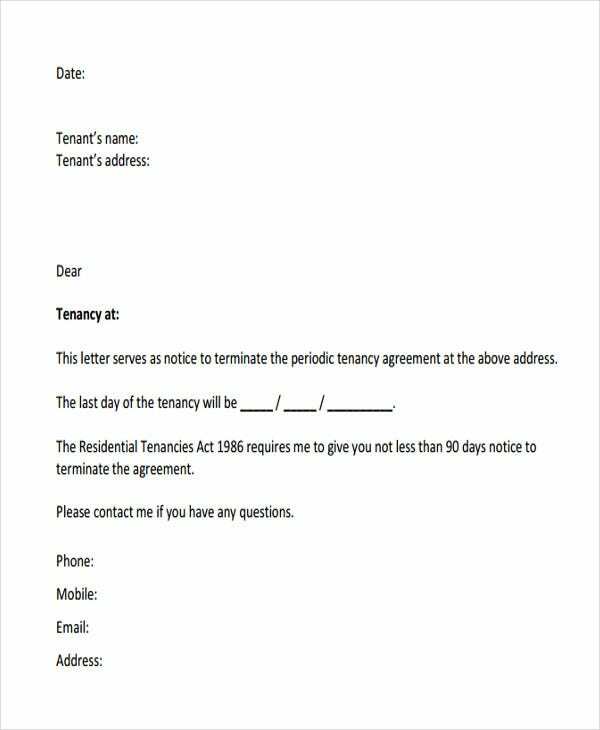 These templates can show you how to write a letter terminating a lease or rental agreement. 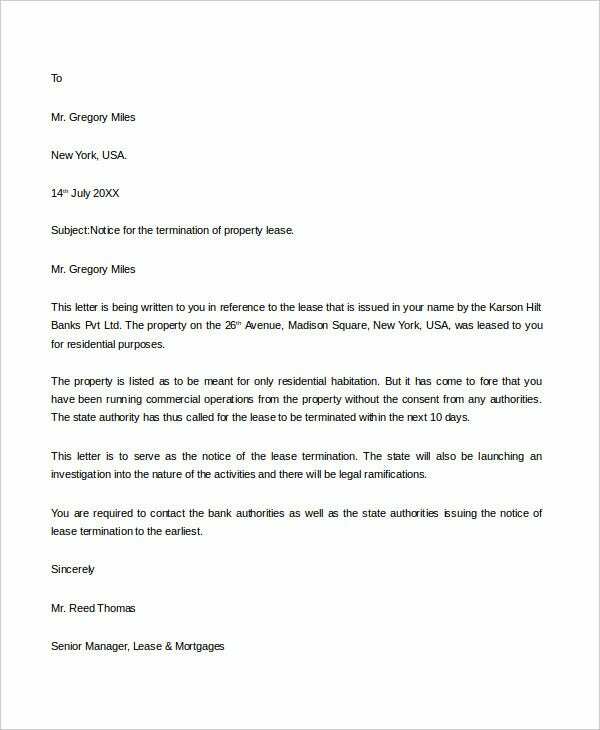 What Are the Valid Reasons for Lease Agreement Termination? the relevant statutes of the state regarding lease agreement termination. 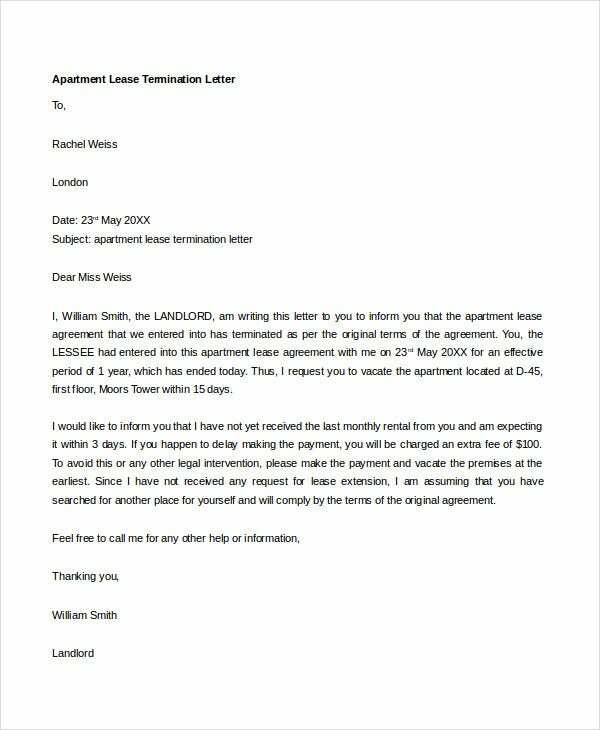 Whatever the ground for termination may be, it must be indicated in the termination letter so the tenant would be made aware of the fairness of such decision. 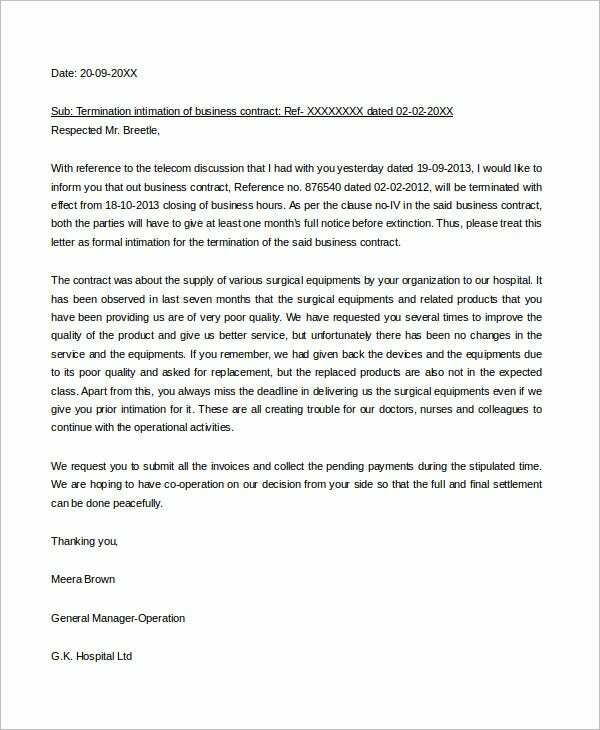 In relation to all these, we also have Patient Termination Letter templates. These templates are perfect for those who are offering medical services to patients. For more reference, simply visit our website’s business archives. What Do You Do During the Employment Termination Process (as an Employer)? 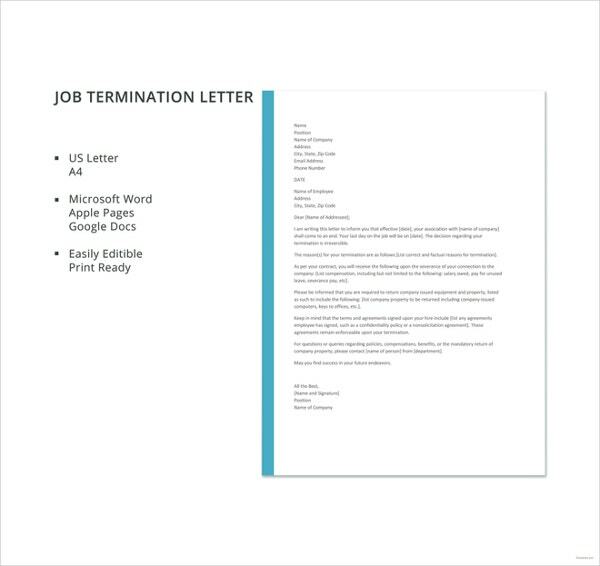 An employment termination letter is a letter sent by an employer or a manager to an employee in order to inform him/her that his/her employment is going to be terminated. The employee-employer relationship is a legally formed one. Hence, its subsequent termination should be done through the careful observation of standard procedure. Assess first whether or not the employee’s action is equivalent to a valid ground for employment termination. If the employee has conducted himself or herself in such a manner that results to a valid ground for termination, then a proper notice must be served. In other words, you must formally issue a warning notice to your employee. This will give him/her time to remedy the situation or change his/her behavior. After a sufficient amount of time has passed and the duration for the remedy has expired, you may now start drafting a termination letter. 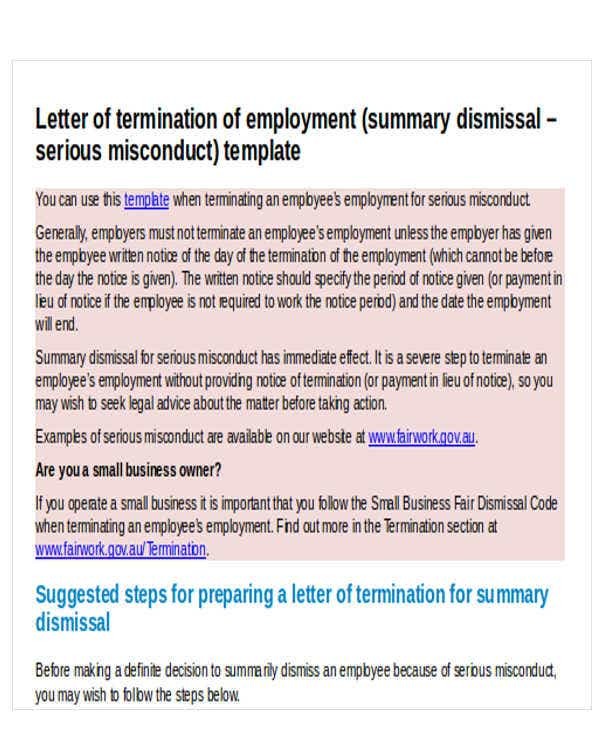 The employment termination letter must briefly explain why you have made the final decision to terminate the employee’s employment in your company. When Can You Terminate an Employment? 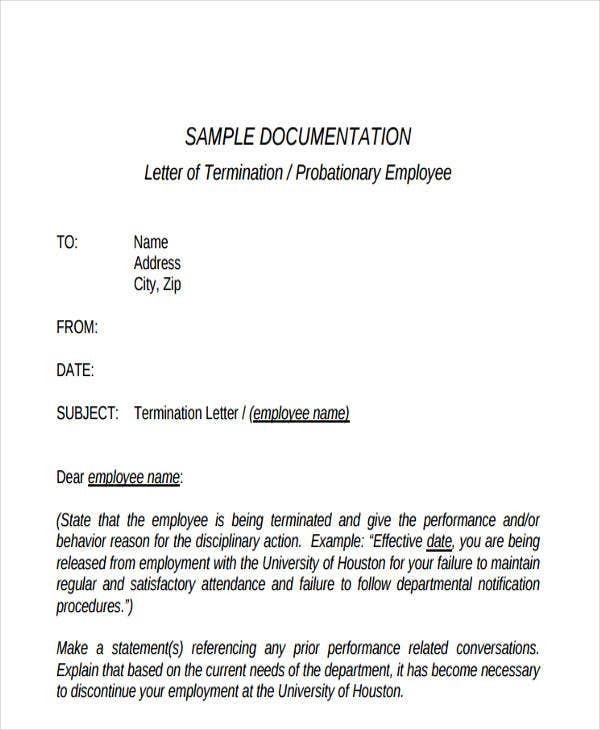 What’s Included in an Employment Termination Letter? Start your letter by stating clearly its purpose which is to terminate the employee’s employment within the company. State the reasonable grounds for the termination. Provide a brief narration of the instances when you have formally warned the employee regarding his/her misconduct. State the employment termination’s date of effectivity. Write your brief gratitude for the employee’s service in the company. Mention the employee’s rights after the termination such as the separation pay, last salary, and incentives, if there are any. 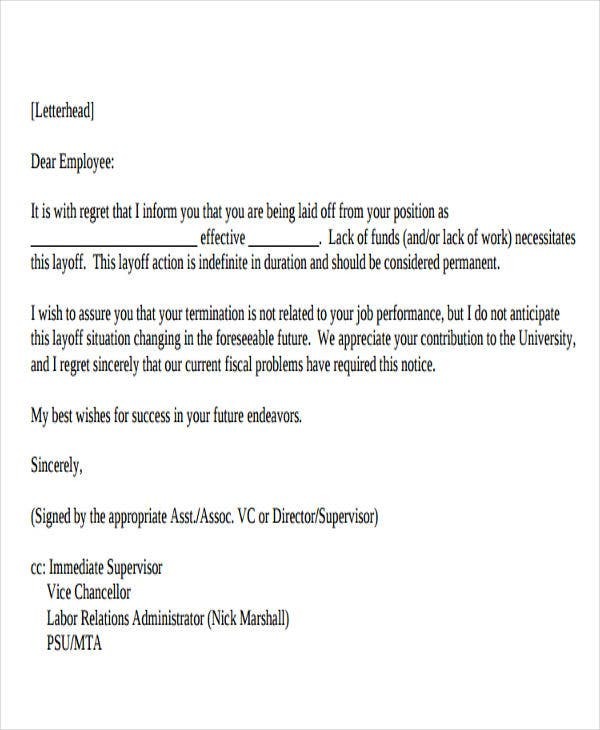 For more reference, check out our collection of Employee Termination Letters.